Today, there are Disney resorts from Paris to Shanghai, but the original Disneyland in Anaheim, California, which has been visited by more than 800 million people to-date, remains one of America's most popular attractions. From the day it opened on July 17, 1955, Disneyland brought history and fairy tales to life, the future into the present, and exciting cultures and galaxies unknown to our imaginations. This bountiful visual history draws on Disney's vast historical collections, private archives, and the golden age of photojournalism to provide unique access to the concept, development, launch, and enjoyment of this sun-drenched oasis of fun and fantasy. Disneyland documents Walt's earliest inspirations and ideas; the park's extraordinary feats of design and engineering; its grand opening; each of its immersive "lands" from Main Street, U.S.A., to Tomorrowland; and the park's evolution through the six decades since it opened. 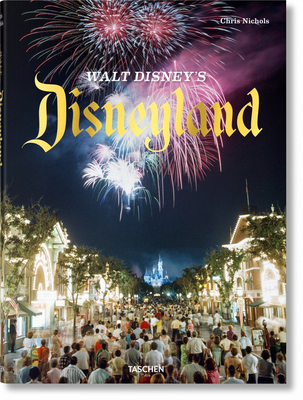 It is a treasure trove of original Disney documentation and expertise, with award-winning writer Chris Nichols drawing on his extensive knowledge of both Disneyland and Southern California history to reveal the fascinating tale of "the happiest place on Earth."